Manchester United recorded the most famous European comeback in their history at Camp Nou but the heroics from that special night in Barcelona are unlikely to be repeated when Ole Gunnar Solskjaer' side go in search of a Champions League semi-final berth. Solskjaer scored the winning goal 20 years ago as United sealed the treble in dramatic fashion against Bayern Munich and ever since Sir Alex Ferguson turned them into prolific trophy hunters that never-say-die spirit has been part of the DNA. It has already been seen a couple of times in this Champions League run, beating Juventus with two late goals in the group stage before memorably seeing off Paris St-Germain in the last 16 despite trailing 2-0 from the first leg at Old Trafford. 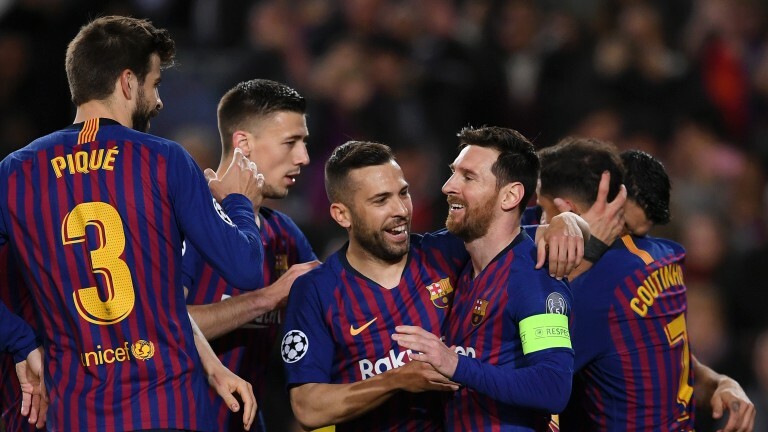 This time things are only half as bad with Barca triumphing 1-0 in Manchester, although the Catalan hosts are nowhere near as flaky at home as the French champions and can finish the job in style. Barca, champions in Spain in three of the last four years and soon to be four in five, are unbeaten in their last 30 home European encounters with 27 victories and three draws. They have progressed on 36 of the 38 occasions after winning away in the first leg and the last failure in such circumstances was in 1984 - against Metz in the now defunct Cup Winners' Cup. Some have suggested Ernesto Valverde's outfit turned in a poor performance in last week's 1-0 victory, such are the standards expected of this current Barcelona outfit. However, they controlled the match with 67 per cent of possession and denied United a shot on target. Having scored early the onus was not on them and the reason United were able to protect themselves was because Solskjaer employed nullifying tactics. At some stage United will have to empty midfield to hunt a goal and that could be when Barca take them apart, just like Lyon in the previous round, with three of the five goals coming in the final 12 minutes. Lionel Messi, like all the first-choice outfield regulars, was rested for Saturday's 0-0 draw at Huesca and could find himself with more space to create compared to last week's first leg. With 33 La Liga goals and 26 in his last 23 appearances in all competitions, Messi is arguably in the form of his life and United will need plenty of luck to keep him at bay. Fortune favoured United in Paris when they scored three goals from five shots and Solskjaer will be hoping one of Paul Pogba, Marcus Rashford or Anthony Martial can provide the spark to ignite the Red Devils. Barcelona, however, have nine clean sheets in their last 14 matches and are a much more stable unit than PSG. Rafinha is Barcelona's only injury casualty. Luke Shaw is suspended but Ashley Young is back from a domestic ban. Alexis Sanchez and Nemanja Matic return from injury, but Ander Herrera, Eric Bailly and Antonio Valencia are ruled out. Bayern Munich in 2013 were the last side to win a European game away to Barcelona.